I guess you would say that horses should have been in my blood, my Grandfather was a saddler and my dad was a jackaroo in his younger years. But my first ride on a horse was an absolute disaster with the pony bolting and me screaming my lungs out. (those that know me could imagine what that would have sounded like). In my teens I got into a group that had horses and from there on I wanted one. The first one I conned my dad to look at was about 16 hands and snorted fire and was attached to the biggest chain I ever saw.” No” said my dad. The next we looked at was bag broken (which is it was blindfolded when first mounted) and trust me it still went like it had a bag over its head, “No” said my dad. My first pony was a delightful fellow called Nugget. He was a beauty and we bonded straight away. I attended Jenko Pony Club which I did till I was 21. 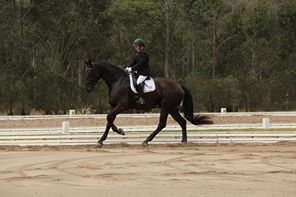 I took up hacking when I was about 18 and had a lot of success with Nugget and even placed at the Sydney Royal Easter show. Sadly Nugget passed away at 14 and I was absolutely gutted. I then purchased a three year old Anglo Arab call Glenallen Romanoff and he was as mad as a cut snake. He would be bucking as I was mounting him and off we would go, I had some success with him when he had all four legs on the ground. Being a grey he had to be put down at 18 because of an inoperable tumour in the lungs. Again gutted. go. This being such a potential to have me crippled or worse killed, I retired Beans and she has a wonderful life at my farm. Then came another little ranga whom I named Charley Puddles, one very talented pony, but could not hold it together at dressage comps and could really turn a dressage test into a rodeo ride. He is just my mate and we ride out together, where occasionally he sneaks in a buck or two. I had a beautiful Anglo Arab called Aurora Australis but his conformation made him unable to do dressage and I found him a beautiful home in the Gold Coast hinterlands. My introduction to warm bloods came in the form of an 18 hand ginger megs, aptly named Hi Tower by us.. Tony Crossley had purchased him from a dealer because his next port of call was going to be a tin can ( a rather large one at that). Toni asked me would I mind riding him which was a feat in its self as he was mentally broken and did not want to go. He would tear at himself when being saddled and once aboard he would whip round and try and bite your leg. Toni asked me if I would take him on and made me a part owner of him. We started out with me gently tapping him on the rump with a small crop and Toni in front asking him nicely to take a step, each slow step he took he was rewarded with big hugs and pats. The rest is history. He competed for a couple of years and we couldn’t be prouder of the big fella. I ride him out more these days as he just loves cantering through the bush (yes, this is the horse that would take 1 hour to go 50 meters.). Hi Tower won our heart and also formed a special friendship with Toni and I.
Toni and I decided that we would buy a young horse together. I found an advertisement for Lotus Park Vincent Van Gogh (Vinny for short), and off we went to Sydney to have a look at him. Once I had ridden him for a couple of minutes I felt he was the right horse. We purchased him and brought him home two days later. I only got a few rides on him and then had to have carpel tunnel surgery and was not allowed to ride for 8 weeks. Cathy Chittenden rode him for us, and did a sterling job of it. We made the state dressage championships last year and got a 10th out of 35 horses in the Preliminary, we were all very chuffed. Vinny and I train with Janice Usherwood and have just started having lessons with Roger Fitzharding. My goal is to get to Grand Prix with Vinny and to have a lot of fun with Toni and my mates along the way. This entry was posted in Getting to know by SDC. Bookmark the permalink.